which is for all purposes identical in function to the original Collatz algorithm. This Demonstration uses the smooth real and complex optimized Collatz map to explore the behavior of the sequence of iterates for parameters in an extended domain when iterated. 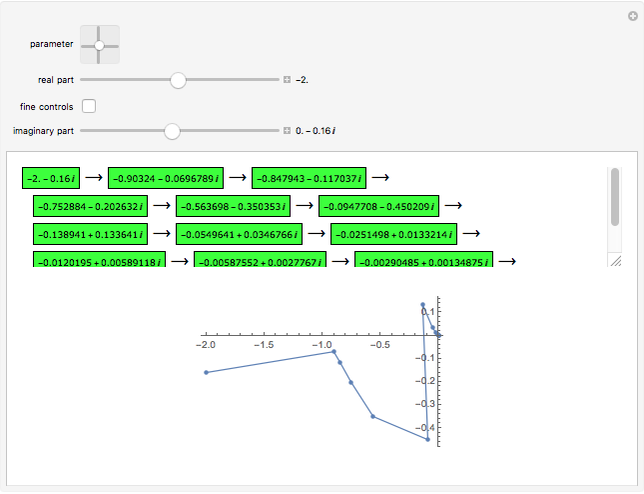 Use the 2D slider to explore parameters in the complex plane with coarse precision, or manipulate only the real or imaginary parts of the values using the sliders. To find convergent complex parameters, activate the checkbox titled "fine controls", which limits the real part of the parameter to between - and . This Demonstration displays the Collatz path numerically and graphically. 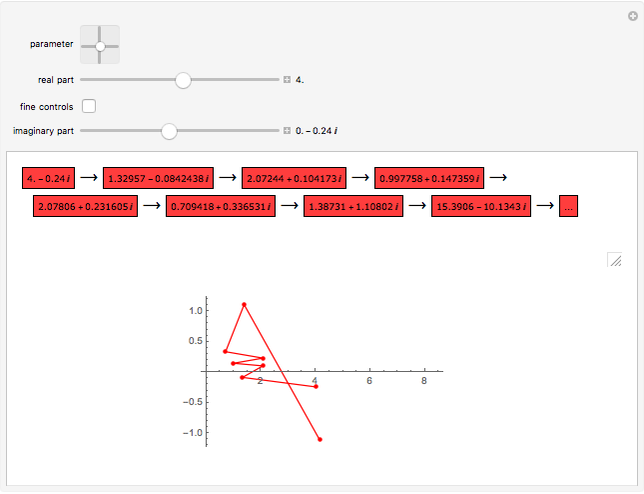 When the parameter's complex part is 0, the graphical chart plots successive iterations on the axis and the number of iterations on the axis. 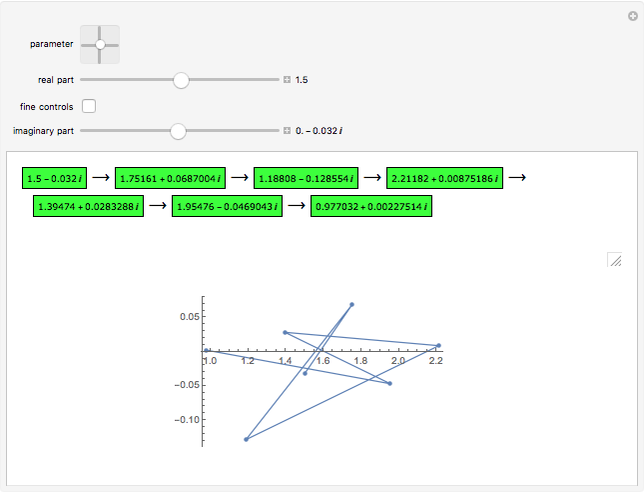 When the parameter has a nonzero imaginary part, the graphical plot switches to plotting the Collatz path in the complex plane. In both cases, the color of the numerical path is green when the Collatz path reaches the number 1, signifying that the Collatz path is considered to have converged. The color changes to red when the parameter has been iterated 100 times without reaching the number 1 or escapes beyond the limit . M. Chamberland, "A Continuous Extension of the 3x+1 Problem to the Real Line," Dynamics of Continuous, Discrete and Impulsive Systems, 2(4), 1996 pp. 495–509. Owen Barrett "Iterating the Collatz Map on Real and Complex Numbers"